Some days ago I read a post about Kins malware (available at http://blog.fox-it.com/2013/07/25/analysis-of-the-kins-malware/). The article is just a sort of sum up of the most interesting thing about this malware. Too bad it doesn’t reveal the details, if you are curious to know something more you have to go deep inside KINS with your own reversing skills. Right now I’m writing this post about the Virtual Machine used by this malware, but I hope to add some more things about KINS in the near future. The analysis is made over KINS md5 hash filename 7b5ac02e80029ac05f04fa5881a911b2, if you prefer you can use one of the other samples too because there are some minor changes only. Every VM has a preamble, in this phase there are some initialization which are often not strictly related with the VM architecture. In this case we have a part which is strictly related with the VM and a part which is not. Another memory movement, this is an important buffer because the goal of the VM is to modify this buffer. DataBuffer will be used later by the malware. Before going through the opcode handlers in detail I think it’s better to tell you something about the VM structure. As I told you before the VM is created for one thing only: modify DataBuffer. Take this in mind! 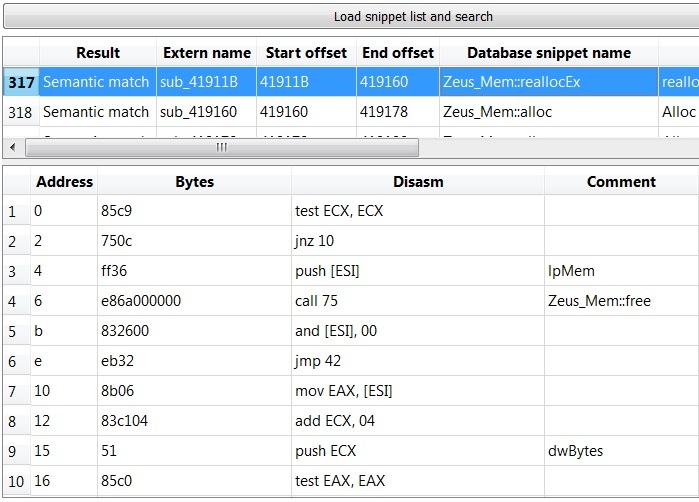 The VM structure is quite simple, you can locate it at the beginning of each opcode handler looking at the bytes pointed by ECX register (ecx is initialized at 407F35). The first dword is the EIP of the VM. It starts from the address of the dynamically allocated memory and it’s updated inside every single opcode handler (except the VMEndOpcode of course). The second dword is dedicated to DataBuffer, more precisely it contains the pointer to that buffer. The third dword is used to store a counter value used for loops, but you’ll understand better in few minutes what it really means. After these initial 3 dwords there’s the space for the VM registers. 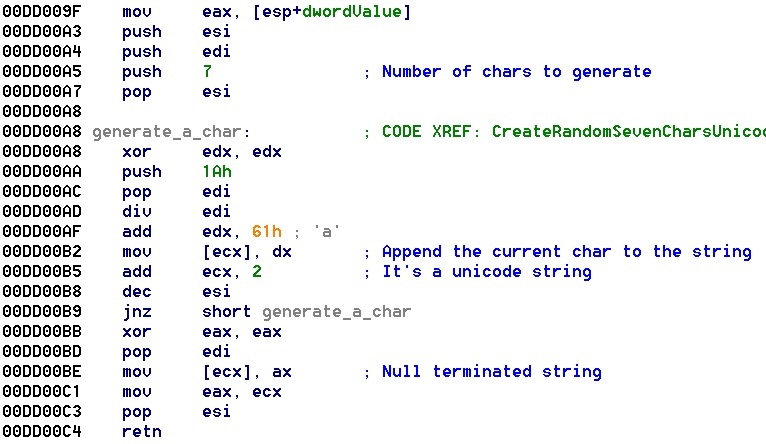 Along the code each register is identified by 4 bits so the VM has been built with 16 dword registers. It’s a simple architecture indeed. The first 4 sets are really easy to understand, while the last one presents some more difficulties. It’s a basic operation but if you think a little bit about this operation you’ll understand how hard is to obtain the VM instruction list. The next opcode is always calculated at runtime and it’s not easy to produce a valid static approach. 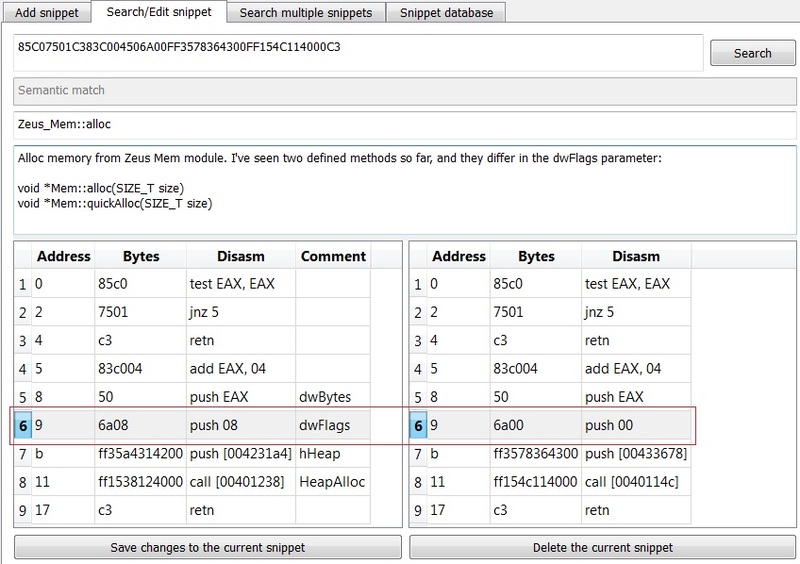 Just to let you understand how to get the meaning of an opcode handler I’m going to show a resume of some samples. It’s used to add a word value from a register to another one. 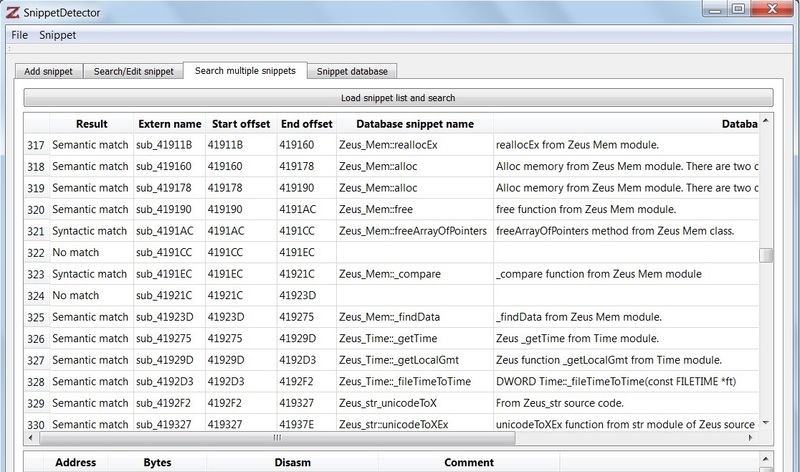 The register indexes are defined by a byte inside the VM byte sequence. 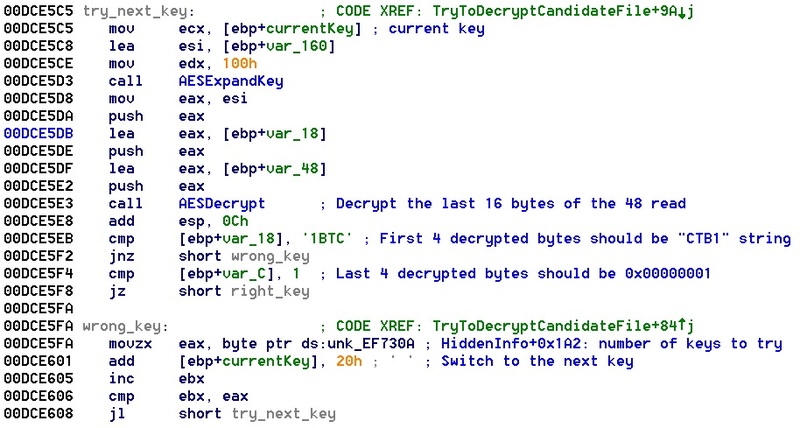 It shuffles the four bytes of a specific DataBuffer dword following a scheme defined by a byte value which is taken from the VM byte sequence. 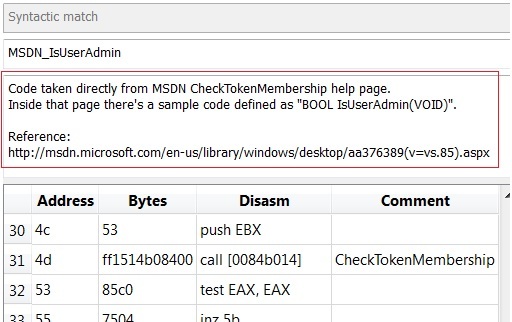 The VM provides a special register, the counter. It contains counter values and it’s used as a counter for loops. The VM can directly set the initial value of the counter register and it can also decrease it, but nothing else is permitted. 41FE2C test edx, edx // Is it 0? As you can see there’s a check on the counter register value, and then the VM.eip is updated according to that value. 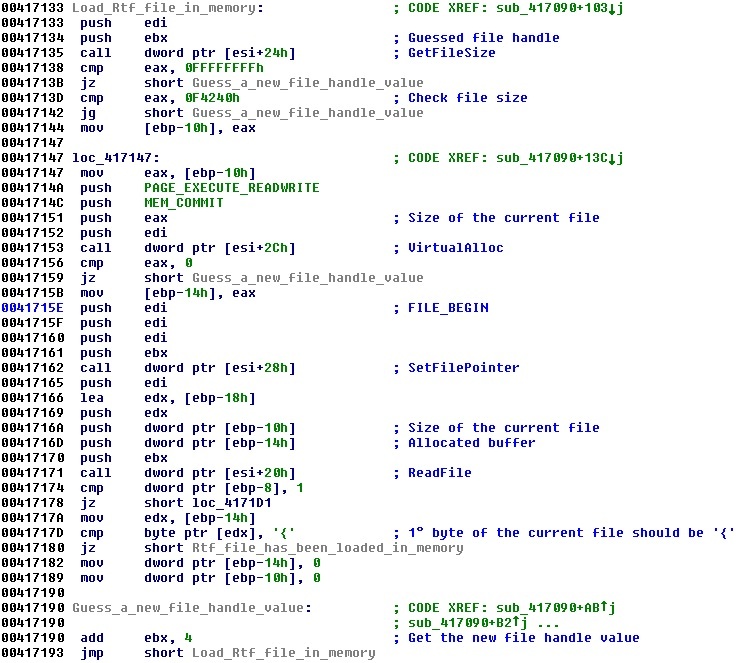 From the analysis of the VM instruction set you can have a general idea of the algorithm implemented inside the VM, everything has been made around DataBuffer. However, if you want to be sure and you don’t want to miss something you can extract the algorithm. 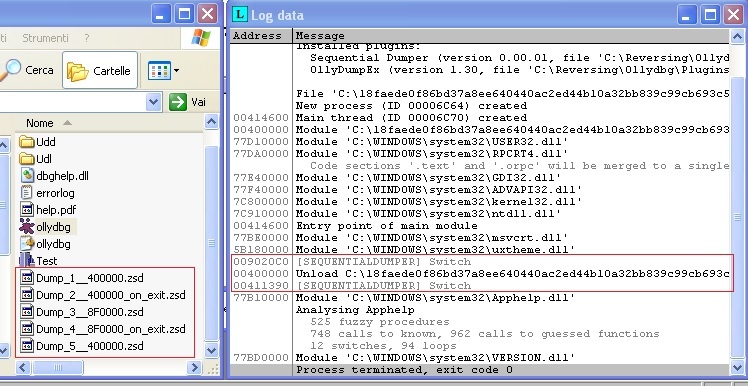 To get the VM algorithm I simply filter a “run trace into” log from Ollydbg (trace starting from 407F2F to 407F43). If you want I can upload the .c code too. At the end of the Fox-it’s tutorial there’s a list with some versions of Kins malware, all of them are using the same VM. There are only some minor changes on the method used to obtain the next opcode (xored values are changed…), but seems like nothing has been changed in the structure/instructions of this virtual machine.